Program for Making Presentations | Download PowerPoint Mindmap now! ConceptDraw MINDMAP is a professional business software for making presentations. You can effectively generate, change, and update your presentation as mindmap and then show, print, export to Word and PowerPoint, make the Project files for MS Project and ConceptDraw PROJECT . Sample 1. 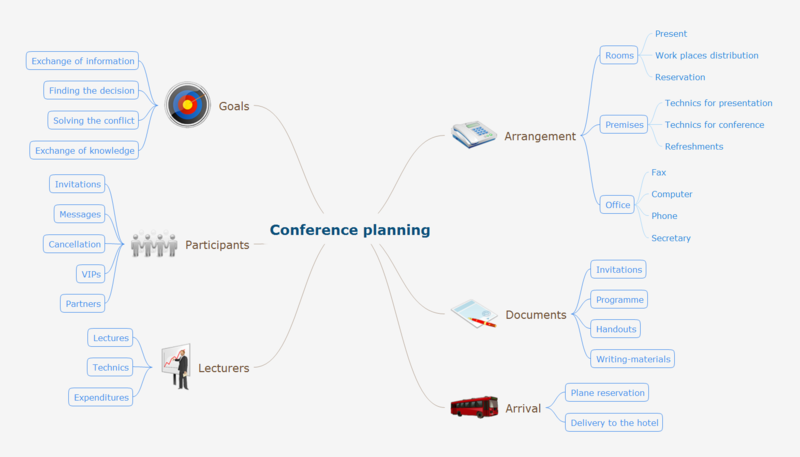 Mindmap presentation - Conference planning. ConceptDraw MINDMAP v10 is the most productive tool you can use to solve problems and generate yout great ideas. A software tool that saves your time on making decisions now has the ability to make decisions with remote team via Skype. To create flowcharts in MS Word, programs designed specifically for the purpose of creating flowcharts are particularly well-suited to the task. ConceptDraw offers you a number of ready-made organizational chart templates which you can use in your drawing. They are grouped in topical sets as organizational chart template files. Use the Organizational Charts Solution for ConceptDraw DIAGRAM v12 to create your own Organizational Charts of any complexity quick, easy and effective. The Organizational Charts designed with ConceptDraw DIAGRAM v12 are vector graphic documents and are available for reviewing, modifying, converting to a variety of formats (image, HTML, PDF file, MS PowerPoint Presentation, Adobe Flash or MS Visio XML), printing and send via e-mail in one moment. Presentation tools. A convenient tool to present documents via Skype. Share your desktop, collaborate on documents in real-time and run a web conference one-on-one or one-to-many. A tool for sharing and presenting business documents via Skype. Allows to present Microsoft® Word®, Microsoft PowerPoint®, Microsoft Project® and plenty mindmapping formats. Tips on how to present a slide show to a group. Deliver a successful presentation to your team.